^ Carolyn Fitzpatrick (24 July 2008). "Heavy haul in the high north". Railway Gazette. Archived from the original on 1 May 2009. Retrieved 10 August 2008. 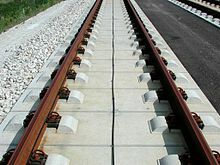 Premium steel rails will not be used, because the material has an increased potential to fracture at very low temperatures. Regular carbon steel is preferred, with a very high premium on the cleanliness of the steel. For this project, a low-alloy rail with standard strength and a Brinell hardness in the range of 300 would be most appropriate. ^ ""Snake heads" held up early traffic". Syracuse Herald-Journal. Syracuse, NY. 20 March 1939. p. 77 – via Newspapers.com. ^ "Snakeheads on antebellum railroads". Frederick Jackson Turner Overdrive. 6 February 2012. ^ C. P. Lonsdale (September 1999). "Thermite Rail Welding: History, Process Developments, Current Practices And Outlook For The 21st Century" (PDF). Proceedings of the AREMA 1999 Annual Conferences. The American Railway Engineering and Maintenance-of-Way Association. p. 2. Retrieved 6 July 2008. 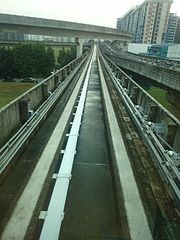 ^ "Continuous Welded Rail". Grandad Sez: Grandad's Railway Engineering Section. Archived from the original on 18 February 2006. Retrieved 12 June 2006.